Special pricing on this page available ONLY through October 31, 2013 !!! Prototype: German Federal Railroad (DB) class V 100.10 diesel locomotive. Era III crimson version. The locomotive looks as it did around 1967/1968. Model: The locomotive has an mfx digital decoder with extensive sound functions. It also has controlled high-efficiency propulsion. 4 axles powered. Traction tires. The locomotive has Telex couplers front and rear and they can be controlled separately. The triple headlights and dual red marker lights change over with the direction of travel, will work in conventional operation, and can be controlled digitally. The headlights are warm white LEDs. The locomotive has detailed buffer beams. Brake hoses that can be installed on the locomotive are included. Length over the buffers 13.9 cm / 5-1/2". One-time series, only in 2013. Prototype: German Federal Railroad (DB) class 52 steam locomotive. Version with a condensation tender. The locomotive looks as it did around 1950. Model: The locomotive has an mfx digital decoder and extensive sound functions. It also has controlled high-efficiency propulsion. 5 axles powered. Traction tires. The locomotive has an articulated frame enabling it to negotiate sharp curves. The dual headlights change over with the direction of travel, will work in conventional operation, and can be controlled digitally. A 7226 smoke unit can be installed in the locomotive. Piston rod protection sleeves can be installed on the locomotive. Length over the buffers 26.3 cm / 10-3/8". Prototype: Dutch State Railways (NS) four-part electric rail car train. Class ELD4, "Koploper" as Intercity powered rail car train ICM-4, road number 4237. 1 motor car as a type mBDk end car, 2nd class, 1 type mB intermediate car, 2nd class, 1 type A intermediate car, 1st class, 1 type sBFk end car, 2nd class. Model: The train has an mfx digital decoder and extensive sound functions. It comes in a four-part version. The powered end car has a die-cast frame. The train has controlled, high-efficiency propulsion with a flywheel. 2 axles in one truck powered. Traction tires. The engineer's cabs in both end cars have interior details. The train has power pickup in the end car at the front of the train; the power pickup changes with the direction of the train. It also has special close couplers with a guide mechanism. The train has factory-installed interior lighting. The interior details vary with the type of car. The headlights, dual red marker lights, and the interior lighting will work in conventional operation and can be controlled digitally. The headlights at car ends 2 and 1 can be turned off separately in digital operation. Light yellow and red LEDs are used for the headlights and marker lights. Warm white LEDs are used for the interior lighting. The construction of the running gear and the bodies is detailed. There is a representation of the "Scharfenberg" coupler with a cover on the end cars. A rigid drawbar coupling is included for multiple unit operation. The end cars come from the factory with closed crossover doors. A plug-in part included with the train makes it possible to represent swinging doors with a diaphragm pushed to the side on one end car. Total train length 114.8 cm / 45-3/16". The "Koploper". In the mid-Seventies, the Dutch State Railways needed new material to modernize its express passenger service. Trains with flexible utilization are required in this densely populated country in order to manage service in the urban areas. As a result, from 1977 to 1994, a total of 144 powered rail cars, the "Koploper" family, were placed into service. These powered rail cars could be separated and coupled at stops quickly and easily. It also became important that passengers be able to change from one unit to the other, when the train was in motion. The engineer's cabs were thus quickly raised up one level and these powered rail cars were equipped with crossovers at the ends. This feature gives the "Koplopers" a brawny, unusual look. The "Koplopers" were built by the firms Talbot, CEM Oerlikon, and Holec, and were designated by the Dutch State Railways as the classes 4000 and 4200, which differed from one another in their motors, among other things. A short while ago the "Koplopers" underwent modernization and were equipped with air conditioning and facilities for handicapped people. These powered rail cars can reach 160 km/h / 100 mph and are run in the classic NS paint scheme, but they have also been used as advertising surfaces such as for the Olympic Games in 2008 in Beijing. The "Koplopers" are certainly a successful development in rail vehicle technology and their unusual appearance is clearly leaving its mark on passenger service in the Netherlands. Order this model now at your MHI specialty dealer! This model can be found in a DC version in the Trix H0 assortment under item number 22262. This model is being produced in a one-time series only for the Märklin Dealer Initiative (MHI). This is the second locomotive in a series of five locomotives with authentic weathering. A tank car set to go with this steam freight locomotive can be found under item number 46533 in the Märklin H0 assortment. Prototype: German Railroad, Inc. (DB AG) class 101 express locomotive. Includes advertising on the sides for the anniversary "25 Years of the Starlight Express". The locomotive looks as it currently does in 2013. Model: The locomotive has an mfx digital decoder, controlled high-efficiency propulsion, and extensive sound functions. 2 axles powered. Traction tires. The trucks have movable reproductions of the mechanical gear for steering them. The triple headlights and dual red marker lights change over with the direction of travel, will work in conventional operation, and can be controlled digitally. The long distance headlights can be controlled separately. The headlights at Locomotive End 2 and 1 can be controlled separately in digital operation. If the headlights at both ends are shut off, the double "A" lights are on at both ends. The lights are maintenance-free, warm white and red LEDs. Length over the buffers 21.9 cm / 8-5/8". 25 Years of the Starlight Express in Bochum. Prototype: Six tank cars of different designs. Privately owned cars painted and lettered for the firms Eisenbahn-Verkehrsmittel AG (EVA), Düsseldorf, Germany and Vereinigte Tanklager und Transportmittel GmbH (VTG), Hamburg, Germany. Three Uerdingen design tank cars with four wheel sets (EVA/VTG), with brakeman's platforms, without a brakeman's cab. One four-axle pressurized gas tank car (VTG) with a heat shield. Two tank cars with two wheel sets (VTG). All of the cars were used on the German Federal Railroad (DB). The cars look as they did around 1960. Model: The tank cars have ladders, brakeman's platforms, and hand brakes. The pressurized gas tank car has a hand brake and a heat shield. The tank cars with two wheel sets have separately applied brakeman's platforms and ladders with filling platforms. All of the cars are weathered differently. All of the cars have different car numbers and come individually packaged. There is also a master package for the cars. Total length over the buffers 67.4 cm / 26-1/2". DC wheel set per car 4 x 32376004, 2 x 32376004 and 4 x 700580 (pressurized gas tank car). This tank car set is being produced in a one-time series only for the Märklin Dealer Initiative (MHI). A steam freight locomotive to go with this tank car set can be found under item number 37895 in the Märklin H0 assortment. Prototype: 2 type Ibblps 379 two-axle refrigerator cars with insulated, smooth side walls and an ice hatch with an icing platform at both ends of each car. German Federal Railroad (DB) refrigerator cars, leased to the firm Transthermos GmbH, Bremen, Germany. Truck as a refrigerated semi-truck rig painted and lettered for the firm Transthermos. Model: Both cars have different Transthermos lettering and different car numbers. Each car has an ice hatch and an icing platform at both ends of that car. Total length for both cars 32.4 cm / 12-3/4". There is also a refrigerated semi-truck rig lettered "Transthermos Kühlverkehr" from the firm Brekina. Length 16.5 cm / 6-1/2". DC wheel set per refrigerator car 2 x 700580. Prototype: Type X 05 low side car. Fictitious paint scheme for Christmas. Model: The low side car comes loaded with a Christmas cookie house made of wood. The car has close couplers with a guide mechanism. Length over the buffers 10.7 cm / 4-1/4". DC wheel set 2 x 700580. Christmas cookie house made of wood as a load. Note: All the 70xxx signals can be mounted below the baseboard (up to 3/8") for realistic looking operation !!! The signal has a movable disk. The signal changes from yellow/yellow to green/green. Stop-and-Go on the Rails. Just like the real life prototype, signals fulfill important control and safety functions on a model railroad too. 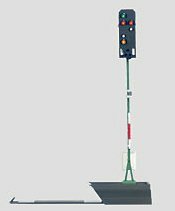 Märklin signals control rail traffic, because they not only show prototypical signal aspects, they also directly influence train movements. When set for stop, they switch the current off in the center conductor and the catenary in their area; the train remains stopped. For "go slow" or "go normally" they switch the current on; the train runs through or starts up again. If you want to be even more realistic, you set up distant signals at an appropriate distance. They are coupled to their home signals and display appropriate signal aspects. 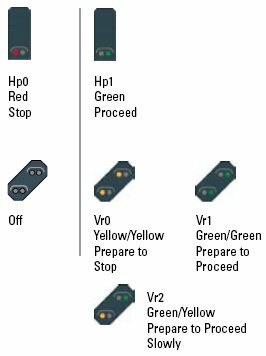 Semaphore/target signals can be controlled conventionally using the 72760 control box and in the digital system using the CS II, MS II, CS I, or the 6040 Keyboard. These newly designed semaphore/target signals have the mfx, Motorola, and DCC digital formats. The mechanisms for these signals are servo drives. The speed of the semaphore / target movement can be programmed. The constant light source is done with LEDs. 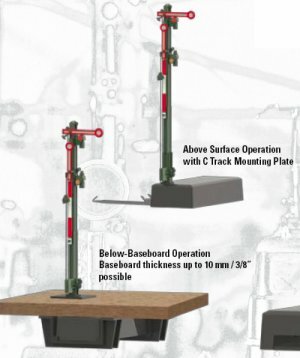 A below-baseboard mounting kit is included to have the signals look realistic on your layout. The signal has a movable arm and movable disk. The signal changes either as the 70361 or from yellow/yellow to yellow/yellow/green. It has 2 servos. The signal has a semaphore and an open narrow mast. The signal changes from red to green. The signal has a semaphore and an open lattice mast. The signal changes from red to green. 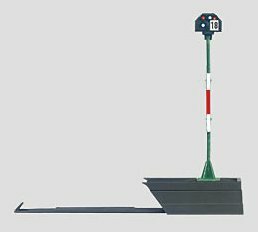 The signal has 2 independent semaphores and an open narrow mast. The signal changes from red to green or red to green/yellow. The signal has 2 independent semaphores and an open lattice mast. The signal changes from red to green or red to green/yellow. The signal mast has a movable front and rear lens. Signal control box for the 70361, 70381, 70391, 70392, 70411, 70412, and 70421 semaphore/target signals and for the 764xx series color light signals. This control box is for operating up to 4 signals. A multi-conductor cable with plugs is included for connecting control boxes together. 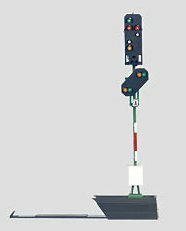 Prototype: German Federal Railroad (DB) standard design yard signal. Dwarf signal without a mast. 2 settings: "Stop" - red/red (Sh0) and "Proceed" - white/white (Sh1). Model: The signal has an integrated electronic signal circuit and 1 separate signal decoder. There is a plug contact on the narrow base of the signal housing. The signal housing has a small lens hood. Control of all functions is possible in the digital system with the signal decoder included with the signal, or in conventional operation with the 72760 control box. The signal decoder can be installed under C Track or under the layout. For digital operation, the configuration and the address can be assigned and tested before installation of the signal. Connections for controlling train movements are on the signal decoder. Height without base 10.0 mm / 3/8". 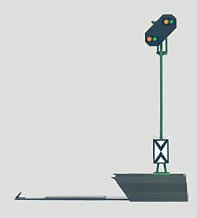 Yard signal for use in switching areas. Signal housing on a prototypically narrow base. The Sh1 aspect is correct with 2 white lights. 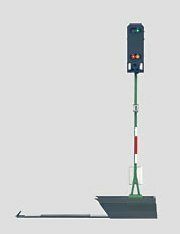 Prototype: German Federal Railroad (DB) standard design yard signal. 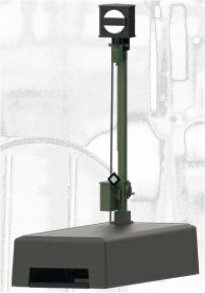 High mounted signal with tubular mast. 2 settings: "Stop" - red/red (Sh0) and "Proceed" - white/white (Sh1). Model: The signal has an integrated electronic signal circuit and 1 separate signal decoder. Control of all functions is possible in the digital system with the signal decoder included with the signal, or in conventional operation with a 72760 control box. The signal decoder can be installed under C Track or under the layout. For digital operation, the configuration and the address can be assigned and tested before installation of the signal. Connections for controlling train movements are on the signal decoder. Height without base 50.0 mm / 1-15/16". Prototype: German Federal Railroad (DB) standard design distant signal. Distant signal with 3 settings: "Prepare to Stop" - yellow/yellow (Vr0), "Prepare to Proceed" - green/green (Vr1), and "Prepare to Proceed Slowly" - green/yellow (Vr2). Model: The signal has an integrated electronic signal circuit. It can be connected to the separate signal decoder of the home signal to which it is assigned. It can be used for all home signals. All of its functions can be controlled from the signal decoder for the home signal. For digital operation, the signal decoder for the home signal assigns the configuration and the address. Height without base 61.0 mm / 2-3/8". This distant signal can be used with all home signals. Signal aspects for this signal are automatically assigned when it is connected to a signal decoder. 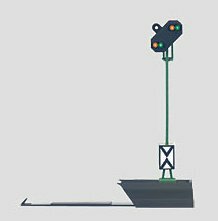 Prototype: German Federal Railroad (DB) standard design distant signal with additional light. 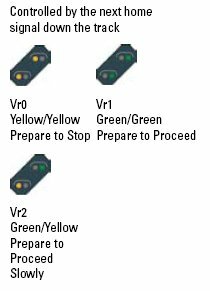 Distant signal with 3 settings: "Prepare to Stop" - yellow/yellow (Vr0), "Prepare to Proceed" - green/green (Vr1), and "Prepare to Proceed Slowly" - green/yellow (Vr2). The white additional light means that the distance between the distant and the home signal is less than the regular braking distance. Prototype: German Federal Railroad (DB) standard design block signal. 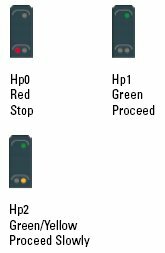 2 settings: "Stop" - red (Hp0) and "Proceed" - green (Hp1). Model: The signal has an integrated electronic signal circuit and 1 separate signal decoder. Control of all functions can be done in the digital system with the signal decoder included with the signal, or in conventional operation with a 72760 control box. The signal decoder can be installed under C Track or under the layout. For digital operation, the configuration and the address can be assigned and tested before installation of the signal. Connections for controlling train movements and for 1 distant signal are on the signal decoder. Height without base 78.0 mm /3-1/16". Block signal for use on main lines. An appropriate distant signal by itself is item no. 76480 and 76481, or a distant signal on the same mast with other signals, item no. 76495 and 76496. 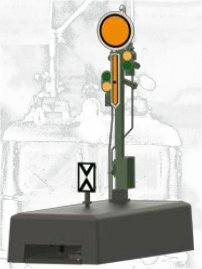 Prototype: German Federal Railroad (DB) standard design entry signal. 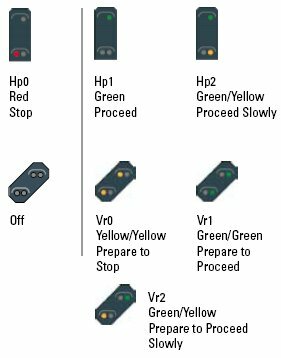 3 settings: "Stop" - red (Hp0), "Proceed" - green (Hp1) and "Proceed Slowly" - green/yellow (Hp2). Model: The signal has an integrated electronic signal circuit and 1 separate signal decoder. Control of all functions is possible in the digital system with the signal decoder included with the signal, or in conventional operation with a 72760 control box. The signal decoder can be installed under C Track or under the layout. For digital operation, the configuration and the address can be assigned and tested before the installation of the signal. Connections for controlling train movements and for 1 distant signal are on the signal decoder. Height without base 78.0 mm /3-1/16". Entry signal for use before stations. 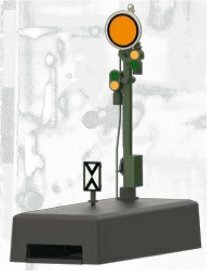 Prototype: German Federal Railroad (DB) standard design exit signal. 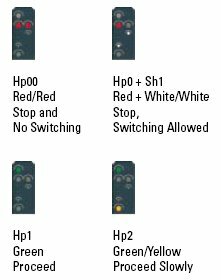 4 settings: "Stop" - red/red (Hp00), "Proceed" - green (Hp1) and "Proceed Slowly" - green/yellow (Hp2,) as well as "Stop, Switching Permitted" - red/white/white (Hp0/Sh1). Exit signal for use in station areas. An appropriate distant signal by itself is item no. 76480 and 76481, or on entry signal, item no. 76497. Built-in yard signal with white light. Note: This signal is available in combination with a distant signal as item 76496. Prototype: German Federal Railway (DB) standard design block signal with a distant signal on the same signal mast. Home signal with 2 settings like item no. 76491. Distant signal with 3 settings like item no. 76480 / 76481. Model: The signal has 2 built-in electronic signal circuits and 1 separate signal decoder. The distant signal can be used for all home signals. Control of all functions is possible in the digital system with the signal decoder included with the signal, or in conventional operation with a 72760 control box. The signal decoder can be installed under C Track or under the layout. For digital operation, the configuration and the address can be assigned and tested before the installation of the signal. Connections for controlling train movements and for 1 additional distant signal are on the signal decoder. Height without base 78.0 mm /3-1/16". 2 signals on one mast without additional connections. Distant signal for use before a block signal or an entry signal. Prototype: German Federal Railway (DB) standard design exit signal with a distant signal on the same signal mast. Home signal with 4 settings like item no. 76494. Distant signal with 3 settings like item no. 76480 / 76481. Exit signal for use in station areas, or for entry to the main line. 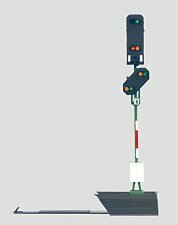 Prototype: German Federal Railway (DB) standard design entry signal with a distant signal on the same signal mast. Home signal with 3 settings like item no. 76493. Distant signal with 3 settings like item no. 76480 / 76481. Distant signal for use before an exit signal. This is a set for installation in a locomotive and comes with a controlled digital decoder and a powerful motor (conversion kit). It will fit into most Märklin H0 locomotives with drum-style commutator motors. The decoder has 80 programmable addresses, automatic switching between the modes of operation, a load compensation feature, and a digitally controlled connection for headlights / marker lights that change over with the direction of travel. The acceleration and braking delay can be controlled with a 6021 Control Unit or with Märklin Digital. 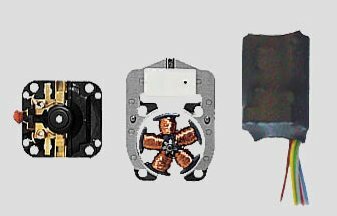 The motor has a 5-pole armature, a powerful permanent magnet field, and a pre-installed bearing plate. Installation hardware is included. Decoder dimensions 25 x 17 x 6 mm / 1" x 11/16" x 1/4". Compact design, controlled digital decoder. Powerful 5-pole Märklin motor to replace an existing motor. Easy upgrade for many older locomotives. Limited rerun, available only as long as supplies last. Important Note! The manufacturer's warranty can only be covered, when this high-efficiency propulsion set has been installed by an authorized dealer. 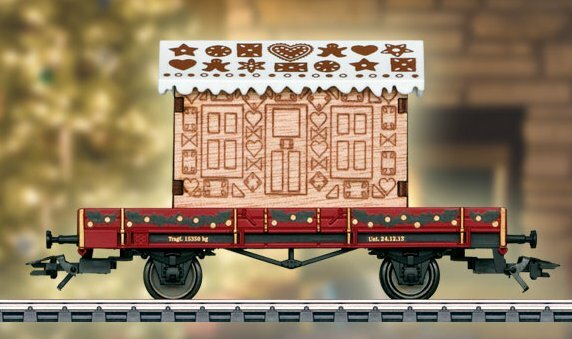 The warranty provisions are invalid if non-original Märklin components are used or if other makes of products not authorized by Märklin are used. Model: This is an old-timer car in a Christmas paint scheme. Length over the buffers 40 mm / 1-9/16". One-time series only in 2013. The Christmas car for 2013 comes in a transparent pine cone. This can be hung on a Christmas tree with the help of the cord included with the car. 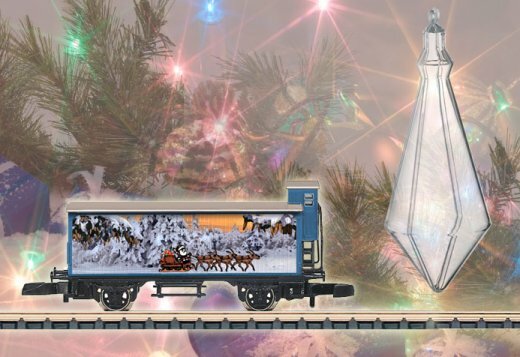 This car continues the series of festive themes from previous years..
Prototype: Typical Era VI commuter car set, consisting of 2 each type Bnrz 436.4 commuter cars, 2nd class, 1 each type ABnr 418.4 commuter car, 1st/2nd class, and 1 each type BDnrzf 463 commuter service cab control car. Model: This is a 4-part car set consisting of a 1st/2nd class car, two 2nd class cars, and a cab control car. The cab control car has warm white/red LEDs as headlights / marker lights that change over with the direction of travel. All of the cars have finely executed extensive paint schemes and lettering. They are equipped with dark nickel-plated metal wheel sets. Total length over the buffers approximately 480 mm / 18-7/8". One-time series for the Märklin Dealer Initiative (MHI) or Exclusiv Program. All of the cars come in a special version and are not available separately. The 87170 car set can be turned into a prototypical commuter train with the addition of the 88787 locomotive. Model: Both trucks are powered. The lighting is warm white and red LEDs that change over with the direction of travel. The locomotive has a fine, extensive paint scheme and imprinting. Length over the buffers 86 mm / 3-3/8". Prototype: German Railroad, Inc. (DB AG) class 218 in a "traffic red" paint scheme and with a 12-digit road number. Model: Both trucks powered. The triple headlights and red marker lights change over with the direction of travel. The lights are maintenance-free warm white and red LEDs. The locomotive has a finely executed, extensive paint scheme and lettering. Length over the buffers approximately 75 mm / 2-15/16". The 88787 diesel locomotive is being produced in a one-time series only for the Märklin Dealer Initiative or Exclusiv Program. A prototypical train consist is formed by adding the 87170 car set to the 88787 locomotive. Prototype: 3 German Federal Railroad (DB) "Silberling / Silver Coin Design" commuter cars. 2 commuter cars (B4nb-59), 2nd class, car numbers 41215 Stg and 41221 Stg. 1 commuter car (AB4nb-59), 1st/2nd class, car number 31028 Stg. Model: The car bodies are finely constructed of plastic with complete detailed interiors and many separately applied details. The cars reproduce the original, typical "peacock's eye" pattern. The cars have detailed underbodies specific to the car types. The trucks are Minden-Deutz designs with brake shoes and separately applied generators. Each car has built-in interior lighting and marker lights that can be controlled digitally with the factory-installed digital decoder. The interior lighting will work in conventional operation. Maintenance-free, warm white LEDs are used for the interior lighting. The couplers have close coupler mechanisms. All of the cars have a scale length at 82.5 cm / 32-1/2". The minimum radius for operation is 1,020 mm / 40-1/8" (1,550 mm / 61" for operation with parallel curves). Total length over the buffers 248 cm / 97-5/8". Car bodies finely constructed of plastic with many separately applied details and with a representation of the "peacock's eye" pattern true to the original. The cars have a scale length at 82.5 cm / 32-1/2". Digital decoders for controlling the interior lighting and marker lights included. The "Silberlinge / Silver Coins" - A DB Success Story. The German Federal Railroad car designated as "Silberling / Silver Coin" is a car adhering to the UIC-X guidelines. It is 26.4 meters / 86 feet 7-3/8 inches long and has 2 entry areas with double doors. The name derives from the car bodies constructed of polished stainless steel. The car group "n", the official designation for the "Silberling", was purchased in a group of 5,000 units between 1961 and 1980 and in different designs. For a long time it was the most widely used car in commuter service on the DB. Depending on the design, these cars tip the scales at 31-40 metric tons and are authorized for a maximum speed of 120-140 km/h / 75-88 mph. The pure 2nd class car has seating for 96, in the mixed class car there is seating for 30 in 1st class and for 46 in 2nd class. The German Federal Railroad placed different cab control cars into service for push/pull operation, which was often done with the class E 41/141. The "Rabbit Hutch", a cab control car with extremely cramped space for the locomotive engineer was replaced by the later "Karlsruher Kopf" type cab control car. This cab control car also had a baggage area, but more importantly a modern, generously arranged engineer's cab. The name derives from the maintenance facility in Karlsruhe, where the cab control cars were rebuilt. The "Silberling" was a universal car, from commuter service to express train, even used as reserve cars in Inter-Zone trains to Berlin. The "n" cars had steam, diesel, and electric locomotives for motive power, and, like many other DB cars, were run in different paint schemes. However, although they have been ignored in mint green, "traffic red", or countless forms of Graffiti, they have remained the "Silberlinge" in popular usage. Presently, these cars are in used on the DB AG in the "traffic red" paint scheme, and similar classes based on the construction principles for the "Silberlinge" can be found in Luxembourg, the Netherlands, and Poland, for example. Prototype: German Federal Railroad (DB) "Silberling / Silver Coin Design" commuter cab control car (BD4nf-59), 2nd class with a baggage compartment. "Rabbit hutch" end with a baggage area and rubber tube diaphragm. Car number 96426 Stg. Model: The car body is finely constructed of plastic with complete detailed interior and many separately applied details. The car reproduces the original, typical "peacock's eye" pattern. The car has a detailed underbody specific to the car type. The trucks are Minden-Deutz designs with double brake shoes and separately applied generators. The car has a built-in mfx decoder with extensive sound functions as well as digitally controlled interior lighting and marker lights. The interior lighting will work in conventional operation. Maintenance-free, warm white LEDs are used for the interior lighting. The couplers have close coupler mechanisms. The car has a scale length at 82.5 cm / 32-1/2". The minimum radius for operation is 1,020 mm / 40-1/8" (1,550 mm / 61" for operation with parallel curves). Length over the buffers 82.5 cm / 32-1/2". Car body finely constructed of plastic with many separately applied details and with a representation of the "peacock's eye" pattern true to the original. The car has a scale length at 82.5 cm / 32-1/2". mfx decoder with extensive sound and light functions included. Prototype: 3 German Federal Railroad (DB) "Silberling / Silver Coin Design" commuter cars. 2 commuter cars (Bnb 719 and Bnb 720), 2nd class, car numbers 508022-12232-1 and 508022-11435-1. 1 commuter car (ABnb 703), 1st/2nd class, car number 508031-53259-1. Model: The car bodies are finely constructed of plastic with complete detailed interiors and many separately applied details. The cars reproduce the original, typical "peacock's eye" pattern. The cars have detailed underbodies specific to the car types. The trucks are Minden-Deutz designs with double brake shoes and separately applied generators. Each car has built-in interior lighting and marker lights that can be controlled digitally with the factory-installed digital decoder. The interior lighting will work in conventional operation. Maintenance-free, warm white LEDs are used for the interior lighting. The couplers have close coupler mechanisms. All of the cars have a scale length at 82.5 cm / 32-1/2". The minimum radius for operation is 1,020 mm / 40-1/8" (1,550 mm / 61" for operation with parallel curves). Total length over the buffers 248 cm / 97-5/8". Prototype: German Federal Railroad (DB) "Silberling / Silver Coin Design" commuter cab control car (Bdnf 735), 2nd class with a baggage compartment. "Karlsruhe" end with a baggage area. Car number 508082�11530-6.